Swift United States Army General Hospital, winter of 1864-1865. Soon after the Civil War began, residents of Prairie du Chien offered Wisconsin Governor Randall the use of Fort Crawford as a location to recruit and train men for the Union forces. At first The Prairie du Chien Guards created an armory in one of the Fort Crawford buildings and held drills and meetings on the grounds. The Prairie du Chien Greys, and then the Prairie Du Chien Volunteers soon joined them. The Volunteers became part of the 6th Regiment Wisconsin Volunteer Infantry, and they and the other companies were sent Virginia. The 31st Regiment Wisconsin Volunteer Infantry was formed in 1862, and Fort Crawford was designated the headquarters for one of the two battalions. 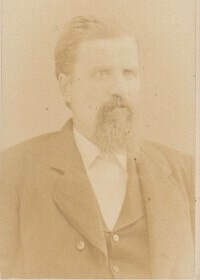 Col. Isaac Messmore was appointed post commander. Under his direction, six companies were formed and drilled at Fort Crawford until the spring of 1863 when they were shipped to the battlefields. About this time, then Wisconsin Governor Edward Salomon decided Fort Crawford was the ideal location for a hospital to care for sick and wounded Wisconsin soldiers. It took over a year to accomplish this goal. In November 1864, the Swift United States Army General Hospital opened. In the one year of its existence 1468 men from Wisconsin, Minnesota, and Iowa regiments received care at the Swift Hospital in Prairie du Chien. The need for space was so great that the Hospital operated in two locations. The main facility of the Swift Hospital was located south of Fort Crawford in a three-story building that had been constructed as a hotel in 1857. Men from Wisconsin regiments were cared for in this building. Men from the Minnesota and Iowa regiments were housed in the Fort Crawford Hospital and one of the fort barracks. General U. S. Grant toured the buildings of the Swift Hospital in August 1865, visiting the few remaining patients. Soon after his visit, the men were discharged or moved to a hospital in Madison. With the closing of the Swift Hospital, the United States War Department had no need for the Fort Crawford Military Tract, and the land and buildings were sold. The Fort Crawford Museum is owned and operated by the non-profit Prairie du Chien Historical Society.